Great things come in small packages: light and nimble, plenty of torque, smooth power, huge MPGs and a low seat for confident handling. AGILE CHASSIS: 58.7 inch wheelbase creates a long, low package with great handling and maneuverability. STRONG BRAKES: 282 mm single front disc brake and a rear drum brake provide plenty of stopping power. 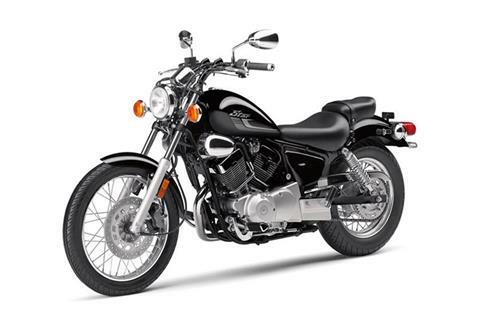 LOW SEAT HEIGHT: Plush and low-stepped saddle keeps the rider sitting low and lets almost everybody flatfoot the pavement. PLUSH SUSPENSION: Telescopic front fork with 5.5 inches of travel provides a nice, smooth ride. Twin rear shocks feature 3.9 inches of travel and adjustable spring preload for versatility under various loads. UNIQUELY POTENT V-TWIN: Air-cooled, 249 cc, 60-degree V-twin engine with a long 66 mm stroke produces plenty of bottom-end torque and smooth roll-on power. And it’s the only V-twin engine in its class, too. SMOOTH RUNNING: Single 26 mm Mikuni® downdraft carburetor ensures optimal fuel/air mixing and delivery with superb throttle response. 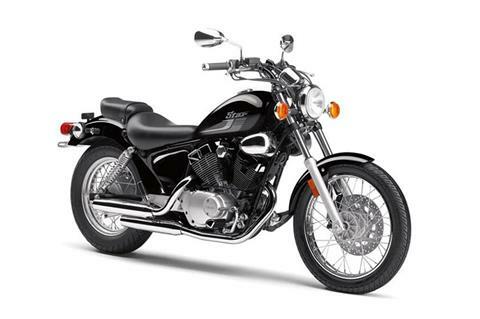 FLEXIBLE GEARING: Widely geared five-speed transmission makes the most of V Star 250’s powerband. ELECTRIC START: Easy, dependable electric starting. CLASSIC EXHAUST LAYOUT: Beautiful dual chrome exhaust pipes let the engine breathe and put out that classic V-twin rumble. LOW MAINTENANCE MOTOR: Automatic cam chain tensioner virtually eliminates maintenance and helps extend engine life. OPEN RIDING POSITION: A custom style handlebar gives the V Star 250 a modern look and comfortable riding position. 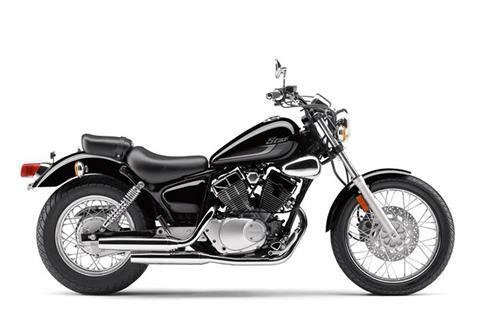 BIG BIKE STYLE: Extensive chrome details accent engine and side covers for incomparable “big bike” fit and finish. GENEROUS FUEL RANGE: Stylishly sculpted teardrop fuel tank features 2.5-gallon capacity for excellent cruising range. FORWARD MOUNT CONTROLS: Forward-set foot pegs enhance rider comfort by creating added legroom. STYLISH FENDERS: Wide rear fender and front and rear wire-spoked wheels add the perfect classic, retro touch to this stylish package. 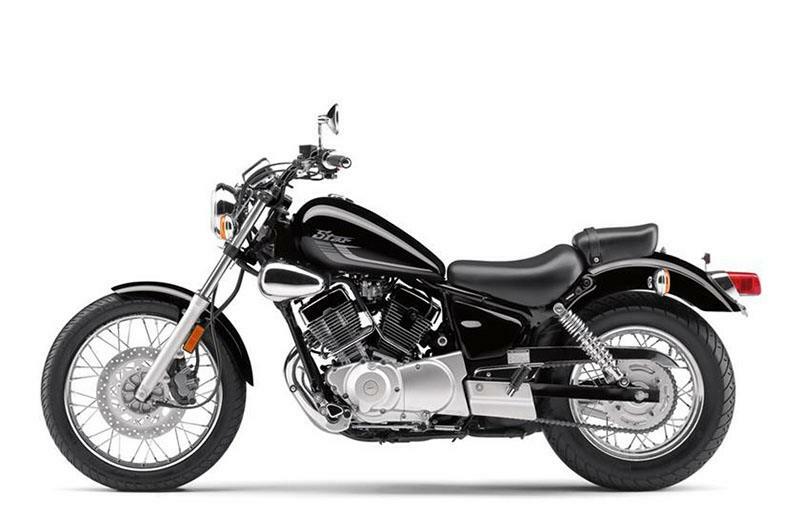 COMPACT CUSTOM: Light weight and a seat just 27 inches from the pavement make the V Star 250® a great trainer as well as a great choice for riders who appreciate the fun that comes in small packages. BIG BIKE STYLE: Dual exhausts, plenty of quality chrome and typical Star attention to detail—this is one sharp little cruiser. STRONG BRAKES: Front disc brake provides highly controllable stopping power. UNIQUE V-TWIN PERFORMANCE: The V Star 250 is the only V-twin in its class. ULTRA-EFFICIENT ENGINE: Estimated 78 mpg* means almost 200 miles between fill-ups. Professional rider(s) on closed area. Dress properly for your ride with a helmet, eye protection, and protective riding gear. Do not drink and ride. It is illegal and dangerous. Specifications are subject to change.